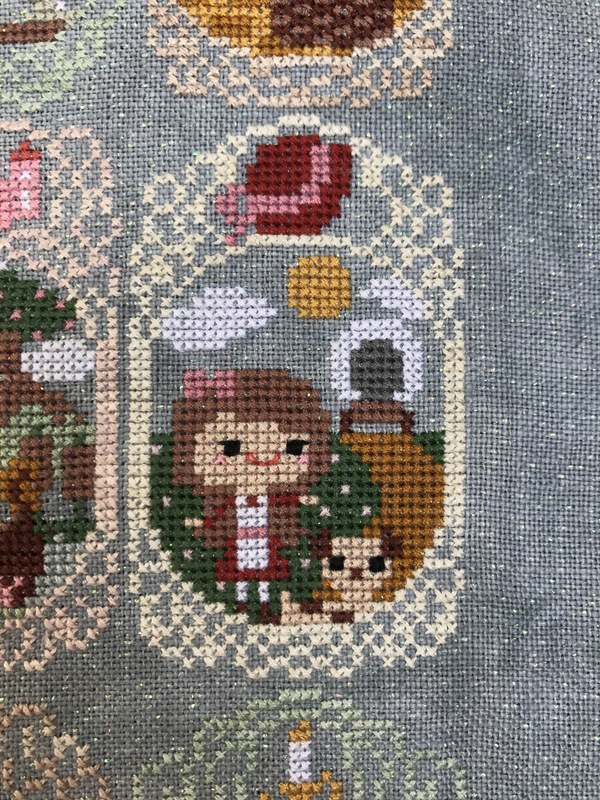 Story Time Sampler – Little House Chart! The last time I shared this project was waaaaaaay back in March of 2015. I love cross stitch. It is the craft I’ve done the longest, but it is slow. Slower than knitting. I have this problem with buying kits and then losing steam. 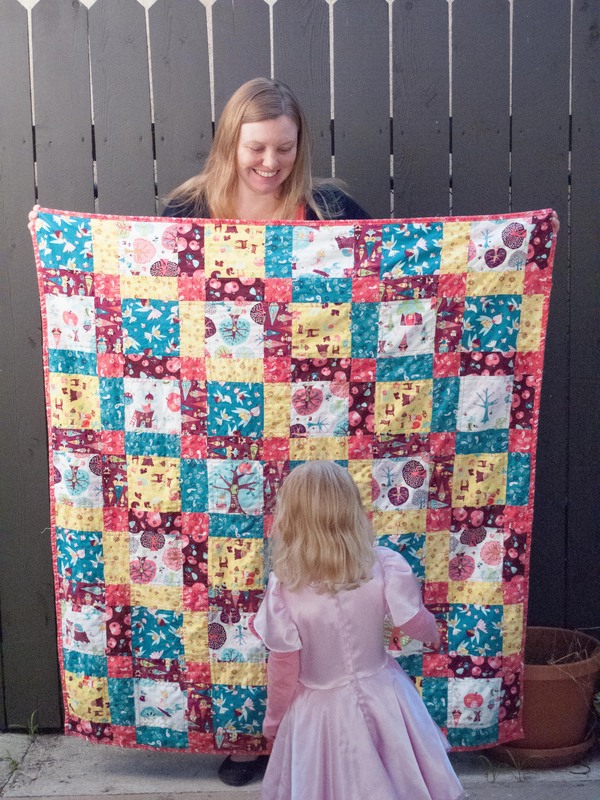 The Story Time Classics stitch-a-long from The Frosted Pumpkin was a project that started off great. I completed the first 3 clues right on time, but then it got put aside for over a year. Looking back at Instagram I now see I started working in the sampler again in July of 2016. Cross stitch is a good summer time project. The light is better and holding linen on your lap is much more comfortable than wool. I finished Story Time back in September 2016 and it has been patiently waiting to be framed ever since. Sorry sampler, your wait just got a lot longer. 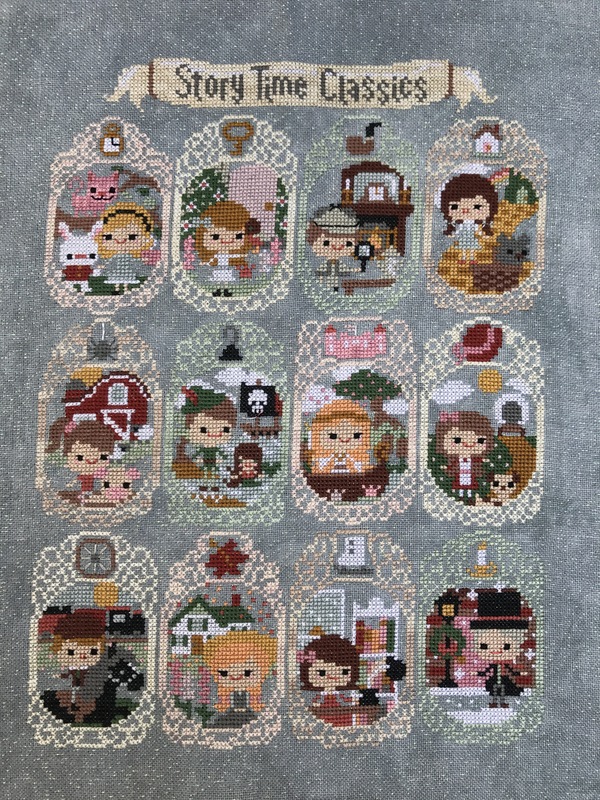 In December The Frosted Pumpkin announced a 3rd sampler in their book series AND I got the kit for the 1st sampler as a Christmas gift so at this point I think I’ll wait and frame all 3 at one time. I’m a pretty big fan of The Frosted Pumpkin style. It is cute and their taste in books really connected with me. So many of the stories were loved by my childhood self. I mean they even put my besties Anne and Jo right next to each other! However I’m not the biggest fan of their original pick for August (Phantom of the Opera). So I swapped in another one of my favorite characters, Laura Ingalls. I’m a huge fan of pioneer fiction and it didn’t seem right to leave Laura out of the party. I took to excel and managed to work out my own pattern for August. Picking a part of the story that would fit in the frame was tough, but I settled on Laura and Jack following the wagon train as a recognizable scene. If you’d like to swap Laura into your own Story Time Sampler just follow this link. The lovely ladies at The Frosted Pumpkin said it was okay as long as I only posted the part I designed. One tab with has a design with Jack and one without. 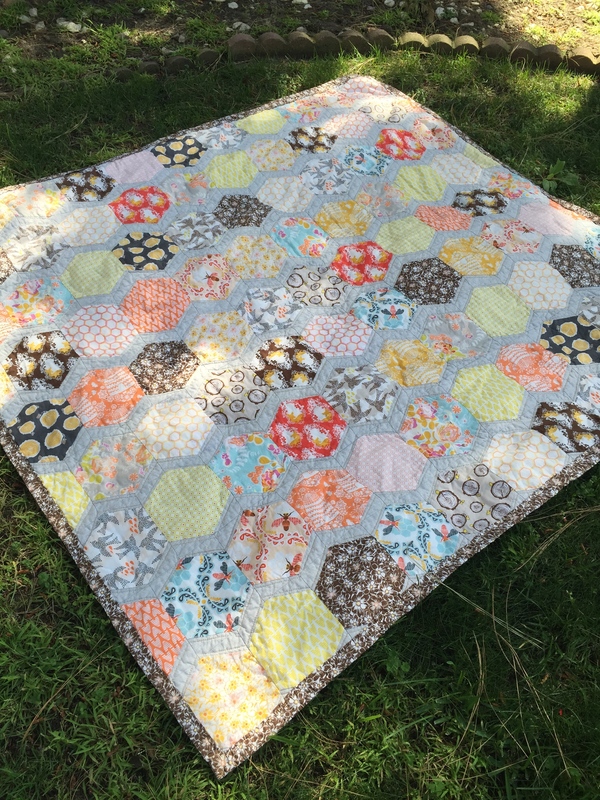 I am in love with the Starflower block from Ellison Lane. It so so pretty and I can think of endless ways to adapt her pattern for many different color combinations. 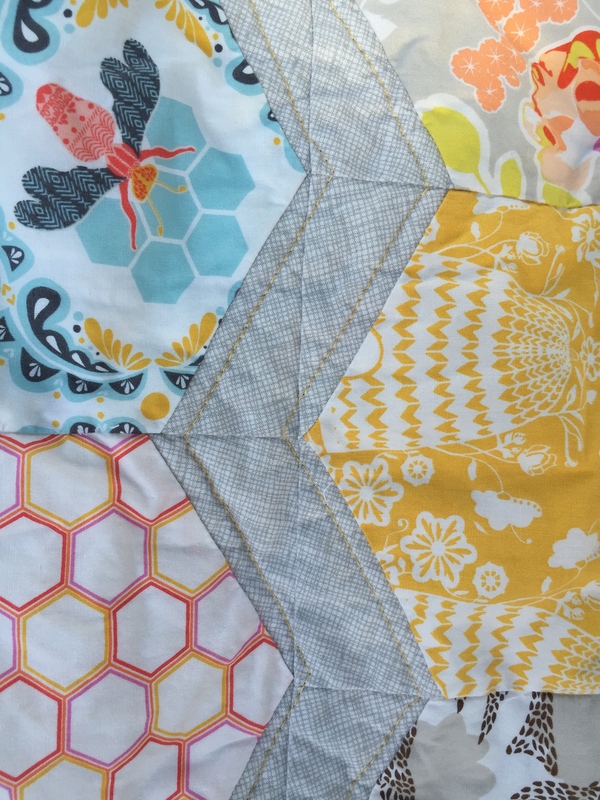 So when I was looking for which block I wanted to pick for my month of the Super Fun Times Quilt Bee I thought the Starflower block would be perfect. The problem is as written her tutorial makes two blocks and it is also smaller than I wanted. So at the advice of a couple friends here is my adaptation of the the Starflower block from Ellison Lane. Adapted for the use of 4 prints and enlarged to an 18.5 inch finished block. 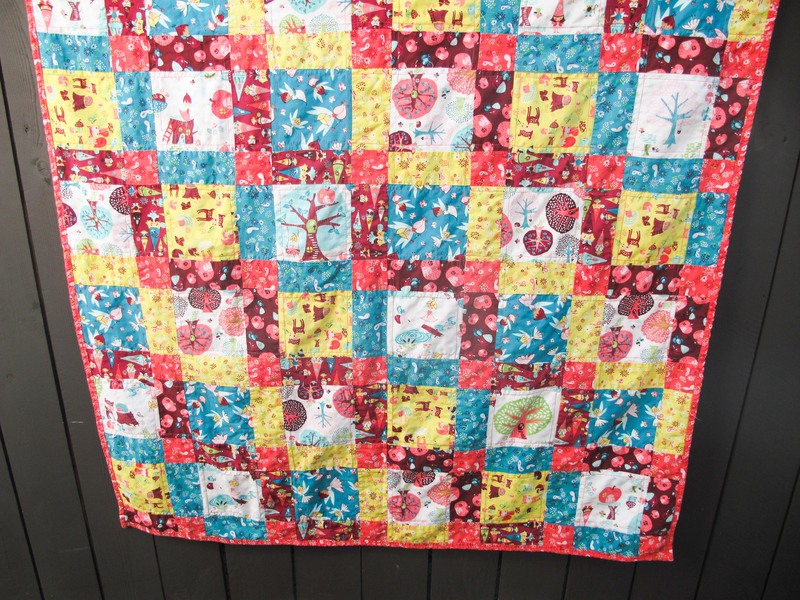 * If using a fat quarter to cut background fabric make sure to cut the strips parallel to the longer edge of the fabric. Start by deciding how you would like your colored square to be arranged in the final square. I opted to have mine go roughly from brightest to darkest. The next step is to pair the fabrics in order to make the half square triangles (HST). Pair 1 of each of the brighter colors and 1 of each of the darker colors. Then pair the remaining colored fabrics with a 5.5 inch background square. Now make your HSTs! Place the pairs with right sides together and draw a line diagonally to mark the center. Then sew a 1/4 inch seam along both sides of the line. Cut each square between the two sewing lines to give you two triangles from each square and press them open with the seam towards the colored square. Then square up your block to 5 inches. Now it’s time to start assembling the block! 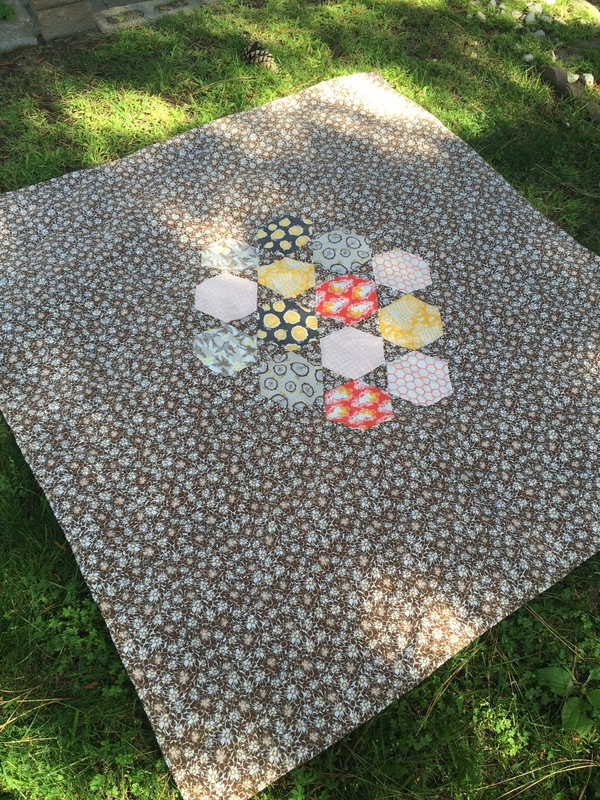 Lay out all of the pieces to check that all the HSTs are as you would like them in the block. This is a great time ensure you are happy with color placement before connecting the squares. Now sew each row together. Then the lower half and upper half are connected. And lastly carefully connect the two halves paying close attention to matching the points as much as possible! Ta-da! All done! Here’s a shot of the back of the quilt. I most often pressed the seams towards the darker fabric, though where two white pieces are connected I pressed the seams open. This worked well over all. Also to help match the center point more easily I sewed that seam from the center out. Here are the colors I’ve picked for my quilt. All my favorites! These 4 were so much fun to put together that I almost didn’t want to stop. Why buy something when you can make it with a skill set you already possess? 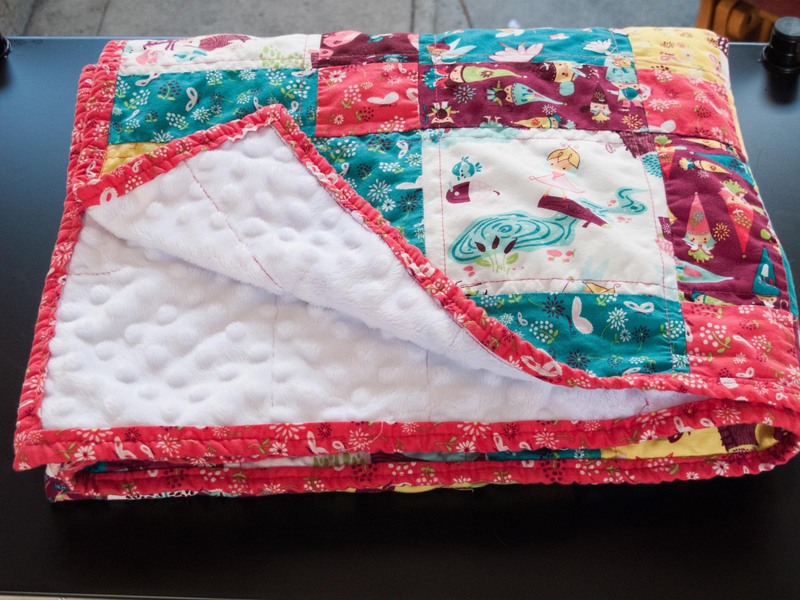 One thing I’ve learned over my lifetime is that what I make for myself lasts a lot better than what I can buy in the store so when I realized Darling Daughter #1 really needed a bigger blanket for nap time at school I decided to try my hand at making one. for fabrics she would like for her blanket. Choice #1 was the Girl Friends ballerina print from Ann Kelle for Robert Kaufman. But I didn’t love it for a blanket. 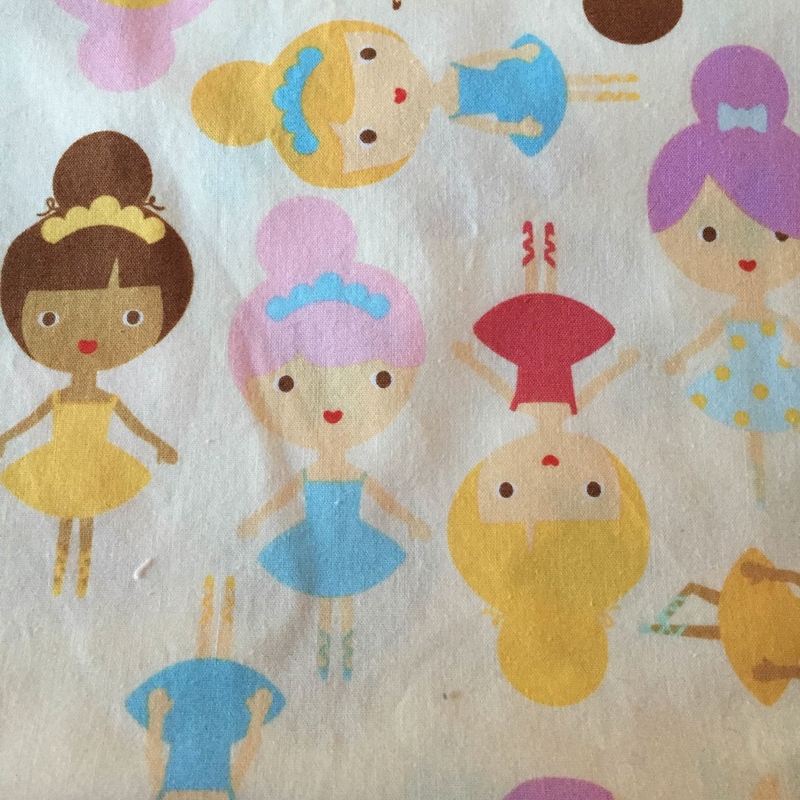 So we looked again and found the perfect collection, Fairyville by Heather Rosas from Camelot Fabrics. I also found a tutorial for making disappearing nine patches on Cluck Cluck Sew. It worked out perfectly. This project has a couple of firsts for me too. 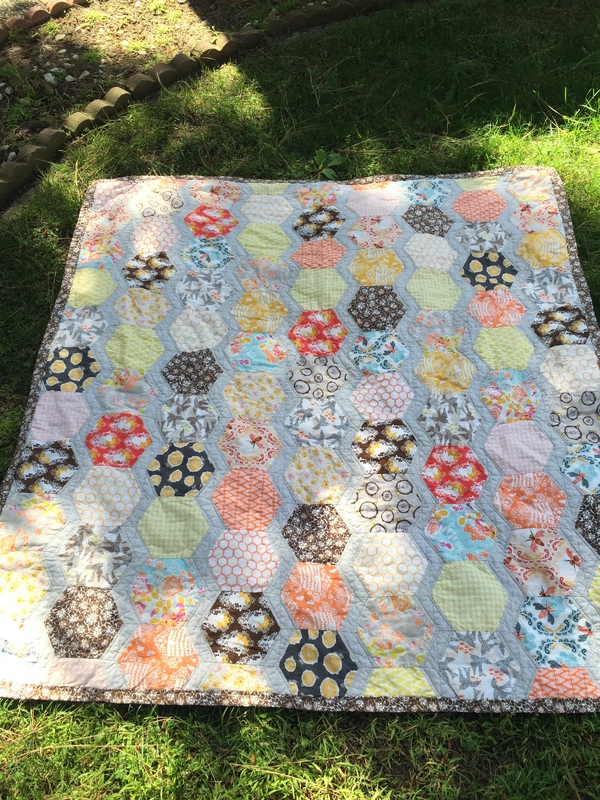 First time machine quilting, first time binding a quilt, and it was my first time sewing with minky. But all want together smoothly and I am so pleased with her little nap blanket. No more baby blankets for my big grown up preschooler. 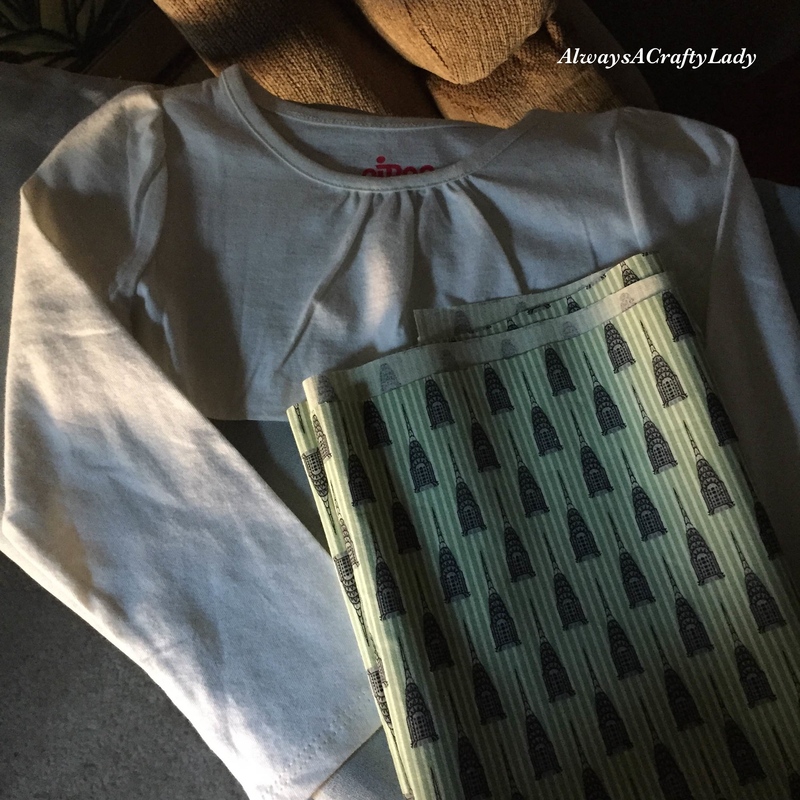 This week I stumbled onto this tutorial for making nightgowns. 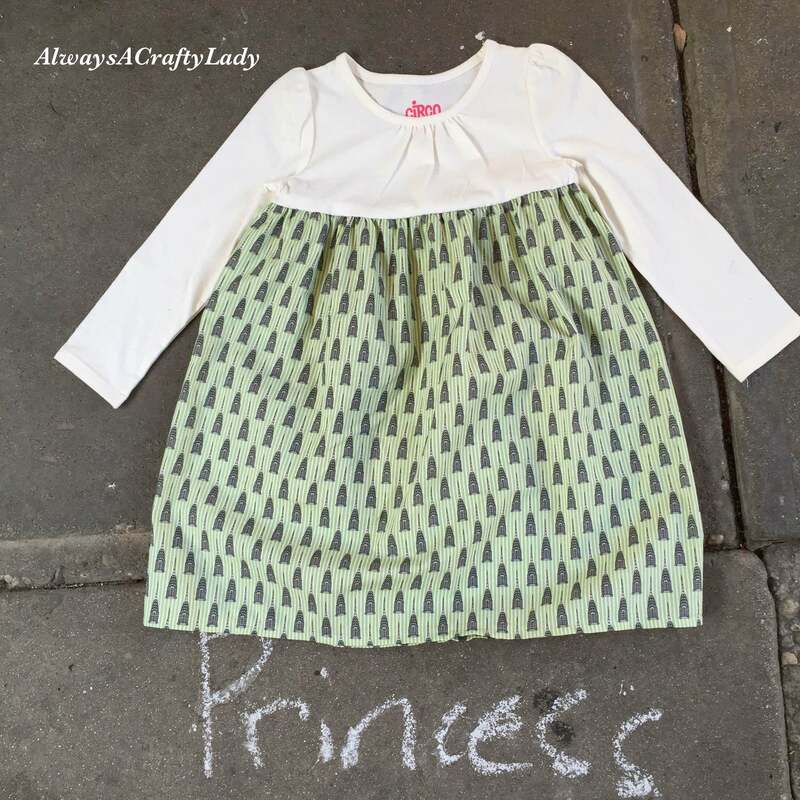 My daughter is a girly girl who loves dresses, so I decided to give this tutorial a try. I’m really pleased with how this turned out. First I took a cheap t-shirt I picked up at Target. I could have used a shirt we already own, but since my daughter rarely wears t-shirts we didn’t have any on hand. Then I took some fabric from my stash (teeny tiny Chrysler buildings) and cut a piece 44 inches wide by 18 inches long. From there I tried to follow the tutorial, but I didn’t feel like pulling down my serger. So instead I ironed on a thin line of interfacing along the cut edge of the t-shirt to stabilize the knit then stitched with zigag stitch on my regular machine. It worked perfectly. At first my daughter didn’t like it. I was sad because I thought it was so darling! 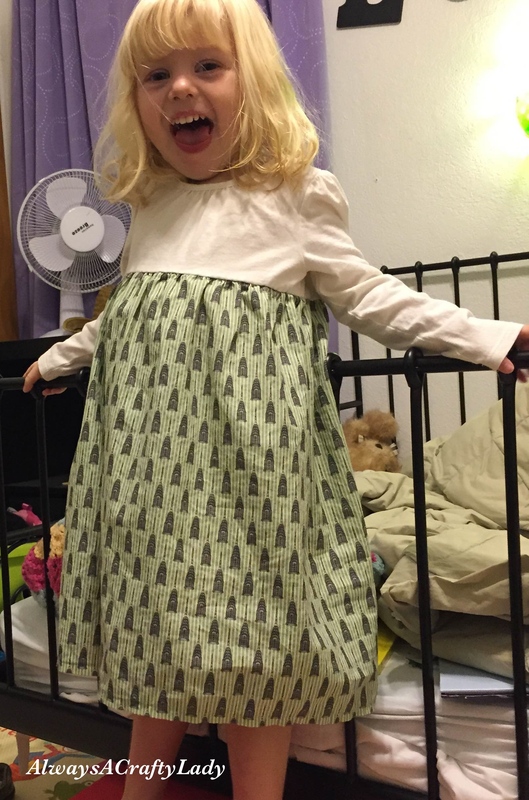 I contemplated slapping something pink on it, but I’m glad I held off because tonight she asked to wear it to bed. So cute! I have supplies for two more and I can’t wait to sew them up.